Sometimes it's hard to get a proper sense of the history of a place, and sometimes it's so in your face that you swear you can hear bagpipes drifting on the wind. 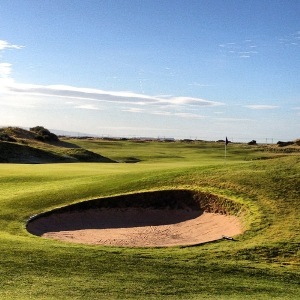 For such a new course Dundonald Links has that sense of place and history. The humble driveway leads through rough humps that could have been an abandoned pitch and putt golf course and reaches a gravel car park. Don't be fooled by the modest clubhouse. The large temporary building houses everything you might need before tackling the links; be it a latte; a shower; a guest locker; or maybe something stronger at the accommodating bar if frostbite is a worry. It shouldn't be, the ever present Gulf Stream means that Dundonald is playable all year round. Even the pro shop befits a clubhouse that puts most others' to shame. Dundonald Links isn't old. Built in 2003 and designed by an American, Kyle Philips (Kingsbarns, Celtic Manor) it is both the epitome of links golf and yet something else. It has practise facilities as good as any Tour facility. The starter is exactly what you'd expect - polite, informative, challenging, knowledgeable. He'll tell you the greens are USGA standard, and then describe the opening holes and the right place to position tee shots...but by then the golfer will already be staring down the intimidating first. The 1st is a long par 4, 430 yards long with a wide fairway which then narrows at a bunker on the left guarding a drive at about 250 yards. A short opening drive will leave a long second into a narrow, two tiered green that requires accuracy if the pin is at the back. Getting off to a par four here is a good start, however a double bogey six might be just as likely. The par 4 2nd is a short, dogleg right, no fairway bunkers here but a small raised tussock of rough in the middle of the fairway is the aim point. When we played, after walking off the green, a lone piper started up, practising from somewhere beyond the green. With the tune of the bagpiper still playing I was quickly brought down to earth by the Par 5 3rd, a 530 yard hole that would be immediately considered a birdie hole if it wasn't for the burn running down the right hand side of the narrow fairway. It then cuts across the fairway forcing a long carry or a lay up for the second shot. The enormous green is protected short and back by bunkers and thick gorse catching anything right. It takes only one errant shot for a score to rack up. Even the piper won't help here. One of the prettiest holes on the course is the Par 3 6th, Its only 155 yards but the difficulty stares you in the face. A burn travels from behind the green down the left hand side of the hole making anything left a no go. A cavernous bunker guards the front of the green, popular for anyone misjudging the wind and elevated green. A small bunker at the back will catch out anything too bold. Bailout front right and the steep slope may make the second shot, back up the green, something more than just a chip. Make no bones about it, this is a great par 3. If the course has taken chunks out of your handicap by now, the 7th and 8th provide an opportunity to get something back and they loop the front nine back toward the clubhouse. The Par 4 9th can be a tricky one. A blind tee shot to a rippled fairway over two bunkers - but it'll be all the nicer by the time you reach the clubhouse and pick up the sausage sandwich (ordered from the ninth tee) before heading to the 10th. Like the first hole, the 10th is a long Par 4 of 430 yards leaning inland toward the omnipresent Caledonian Paper Mill and away from the sea. Hitherto unmentioned, yet so big it's visible from every point on the course. The hole seems at a juxtaposition with this, with big wave-like ripples in the fairway not knowing which direction to throw your tee shot in - not unlike the course itself, swaying between modern and traditional. The short 11th is only 120 yards long (from every tee! ), but the danger is obvious. A pitch over a marsh, three bunkers short and a steep slope on the right side of the green that will not only take a good golf shot off the green forty yards down hill, but leave you with a blind pitch to boot. For such a short hole, a three is greeted with relief. My tip here is wherever the pin might be, aim left of Ailsa Craig, floating above the green. Try not to be distracted by all of this and consult your course guide to avoid a wickedly positioned pot bunker - 15 yards off the back of the green - catching anything long. This bunker isn't seen from the tee, it's ingenious and wholly inappropriate! The 12th affords the first real sea view, and has a fairway that splits either side of what looks like a burial mound of unkempt rough. The 13th, a short par 4, is archetypal as it runs adjacent to the railway line like so many others on this stretch of golfing coast. The 450 yard Par 4 16th is a gorgeous hole, with a line of mounds running down the left and trees and the railway on the right. A bunker right in the middle of the fairway must be cleared before the hogs-back fairway throws the ball either left or right. The narrow green itself is two-tiered and any shot here needs to be accurate. The 18th is a great finishing hole, a Par 5 of 545 yards. The drive here is not intimidating, but up at the green yet another burn cuts back in front of the green ensuring that this hole is a proper three shot hole for all but the longest amateurs. For those not quite long enough, four fairway bunkers intimidate the second shot. Another pair of bunkers lurk at the back of the green, protecting the green from any overcompensated approach. Depending on where you place your second shot a four, five, or six might be a satisfactory finishing score. As the sun sets over a thoroughly enjoyable round we headed to the bar to discuss the merits of Dundonald. Thee are many, Dundonald embraces the style and feel of something much older and has all the hallmarks of a classic links. Nowhere on the course is safe from bunkering. 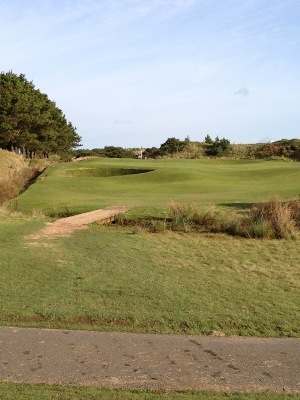 There are undulating fairways and dunes bordering almost every hole. Wee burns and blind tee shots. Patches of rough adorn the middle of fairways and there are big rolling greens too. Yet contemporary touches abound, almost every green seems slightly raised, often encouraging a lofted pitch. And then there is the two loops of nine, starting and returning by the clubhouse. Dundonald Links certainly holds its own amongst its neighbours and further afield too. 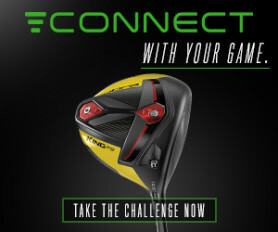 It has already attracted pre-qualifying events for both the Senior British Open and Tour School Qualifying. Key to Dundonald's success is its accessibility as it is owned by the Loch Lomond Group and built to be an all year round course for members of the private Loch Lomond Club. Weekend golf opportunities and reasonably priced when compared to the rest of the Ayrshire golfing coast. However, what really sets it apart is understanding that the modest clubhouse and a pristine course is testament to the priorities that Dundonald Links holds. Here, the golf is all about the golf.